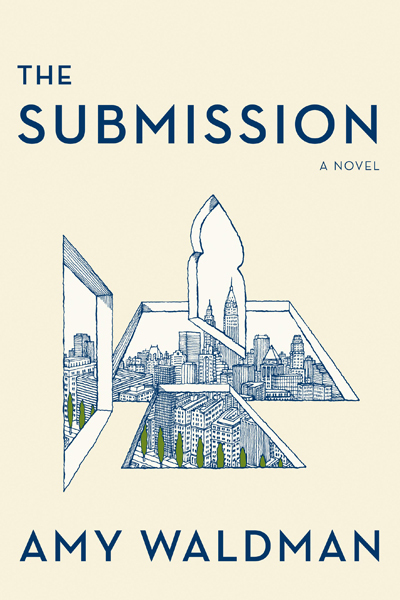 For many months The Submission had a different cover entirely (it’s on the galley) which had appealing elements but didn’t seem to cohere. Perhaps I had been spending too much time with my characters, but I kept thinking, This is not a cover of which Mo—Mohammad Khan, the stubborn architect at the center of The Submission—would approve. Then, at the proverbial last minute, FSG hired a new creative director, Rodrigo Corral, and I was invited to look at his “tweaks” to the cover. The tweak, in fact, involved scrapping it entirely. Instead, Corral presented a black cover into which he had embossed, also in black, French curves, an architect’s tool, with THE SUBMISSION in white type. Here was a cover I could imagine pleasing Mo. I loved the elegance and starkness and mystery of it (most non-architects assume the French curves are related to Arabic). The design seemed perfect for a novel that is about how to read symbols (Mo’s design, a possibly Islamic garden, becomes a source of controversy) and how to read people. Since the book came out I’ve had numerous writers say, “I can’t believe they let you get away with a black cover.” I wasn’t aware we were getting away with anything! If one argument for the continuing production of physical (as opposed to digital) books is their presence as an object in the world, Corral gave The Submission an object power. At its heart, The Submission is about our inability to deal with the emotional devastation of 9/11. Amy Waldman shows us how collective attempts at grieving and rebuilding are eroded by political instrumentalism, racial essentialism, and finger-pointing. This cover features a French curve—an architect’s tool—debossed in black onto a black surface. Symbolic of the novel’s protagonist Mohammed Khan, a Virginia-born agnostic, the image looks as if it could be Islamic but is entirely secular. I like the idea that the tool is rendered invisible until you approach it—much like Mo Khan, who is shrouded in other people’s stereotypes and speculation, threatened equally by indignant protestors and Muslim imams, all for proposing a winning design for a garden intended for healing. Like the novel, the cover indicates how we can only ever deal with grief by countenancing the internal struggles and terror that lie beyond surface expressions of tolerance and solidarity.